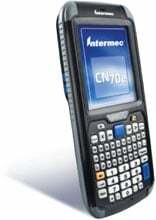 Intermec CN70e Non-Incendive - WLAN, Non-Incendive, 2D Imager Scanner, QWERTY Keypad, Bluetooth, 1GHz Processor, 512MB/1GB, Camera, FlexNet, GOBI Radio, Windows Embedded 6.5, Smart Systems. Interface cables and charging cradle sold separately. The Intermec CN70EQ4KCF2W6110 is also known as Intermec Technologies	INT-CN70EQ5	.